When a fire in London destroyed the street level restaurant it started in and the three floors of offices above, Darenth Valley and sister company D Hammond worked together to make safe, strip out and refurbish the entire building, negotiating the challenges of working in a busy central London location. 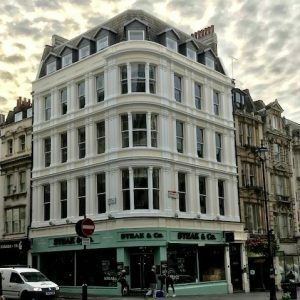 BMO is the commercial landlord of three floors of office spaces above a busy restaurant located on the corner on Haymarket and Panton Street, in Central London. 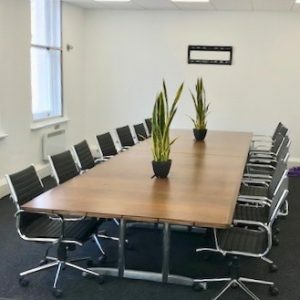 Trident Building Consultancy are the appointed Building Surveyors for the building and the offices are fully occupied, home to multiple businesses in a sought after city location. In January 2018, more than sixty firefighters in eight fire engines tackled a fire caused by an electrical fault in the Steak and Co restaurant on the ground floor, which had quickly spread through the risers in the building, causing extensive damage to most of the second floor and to parts of the third and fourth floor. The fire took eight hours to dampen down so the damage was substantial and the businesses that occupied the affected offices were displaced. Health and safety is always first and foremost when attending any fire damaged building, and in order for the full scale of the refurbishment works to be realised, the building had to be made safe (1), a task that Trident Building Consultancy asked the team at D Hammond to perform. On consideration, D Hammond recommended that this part of the project be carried out by sister company, Darenth Valley Building Services whose skill set leans more towards the reactive maintenance that this required here. Trident agreed to the suggestion and Darenth Valley was brought in. Darenth Valley attended immediately and carried out the necessary checks and immediate repairs to be able to sign the building off as safe and allow entry for Trident Building Consultants and structural engineers. However, it was immediately apparent that the offices would require a complete stripping out (2) so that a full and comprehensive assessment could be made. Due to their long-standing client relationship with Trident Building Consultancy, D Hammond were again asked to quote and following on from the make safe that Darenth Valley performed, D Hammond were then brought in to perform the stripping out and the enabling works. Upon completion of the stripping out due to our intimate knowledge of the building and for speed, the insurance company were keen for D Hammond to continue to work with the restaurant contractors’ as they were under pressure to resume business. We were asked to quote and subsequent negotiation for the complete refurbishment (3) of the offices above. The job was a complex one which would require input from a vast number of trades and the very best project management skills. From the complete mechanical & electrical refurbishment of the building, new toilets, new water supplies and plumbing, ceilings and floors – it took four months for D Hammond to restore the two offices, common parts and external redecorations and repairs, in that time they coordinated electrical, mechanical, carpentry, roofing, flooring, decorating and scaffolding trades. 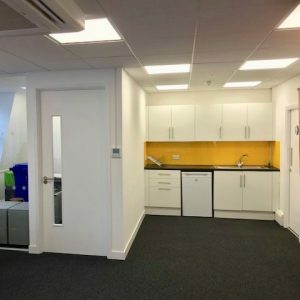 BMO was keen to fully upgrade the building facilities and not miss the opportunity, in its vacant state, to maximise its letting potential and to ensure that the business who occupied the offices felt some sense of recompense for the inconvenience of their temporary relocation. Happy tenants returned and business was very much as usual. Haymarket was a refurbishment that could have been problematic for contractors not familiar and experienced with inner city projects. The challenging nature of co-ordinating building work with adjacent tenants, tricky access from a busy pedestrian street and orchestrating multiple trades was a challenge but the D Hammond Group rose to it. Darenth Valley provided the immediate make safe response with D Hammond using it skills in handling large scale projects in central London to carry out the full stripping out and refurbishment – fulfilling the Group’s promise to deliver single source building maintenance and refurbishment for its clients.